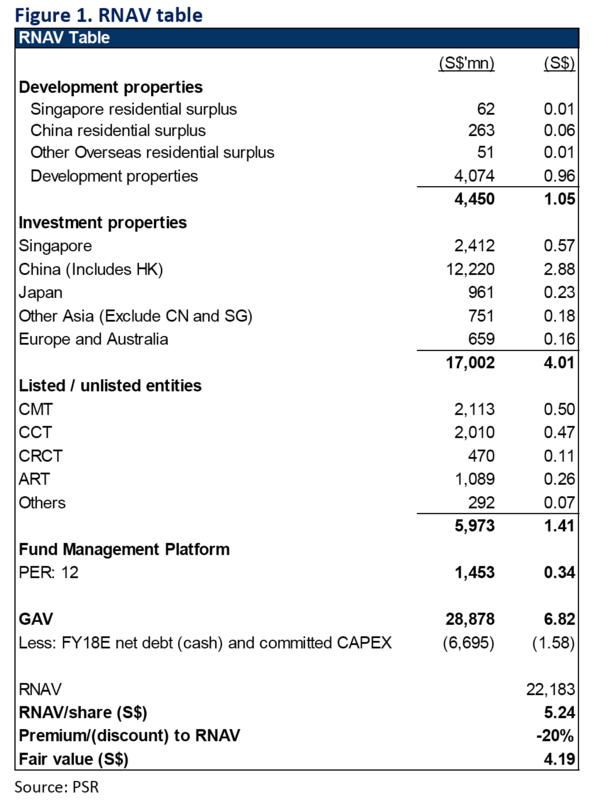 CapitaLand’s revenue and adjusted net profit in line with our forecasts. Strong earnings growth driven by increase in recurring income. $3bn annual asset recycling target achieved in just 2 quarters. Same-mall y-o-y tenant sales growth stable at 5.4% for China, CapitaLand’s biggest market. Overall Serviced Residences RevPAU grew 4% y-o-y, driven by strong performance in China, the Group’s biggest market by portfolio valuation. Maintain ACCUMULATE with unchanged Target Price of S$4.19. + Strong earnings growth driven by increase in recurring income. While EBIT from development properties fell 44% in 1H18, this was cushioned by a 54% jump in earnings from the recurring segments of retail, office, and serviced residences. Excluding the consolidation effect of the three trusts CapitaLand Mall Trust (SGX:C38U), CapitaLand Retail China Trust (SGX:AU8U), and RCS Trust, we estimate EBIT from these recurring segments increased 20% y-o-y. + $3bn annual asset recycling target set at end FY17 achieved in just 2 quarters. 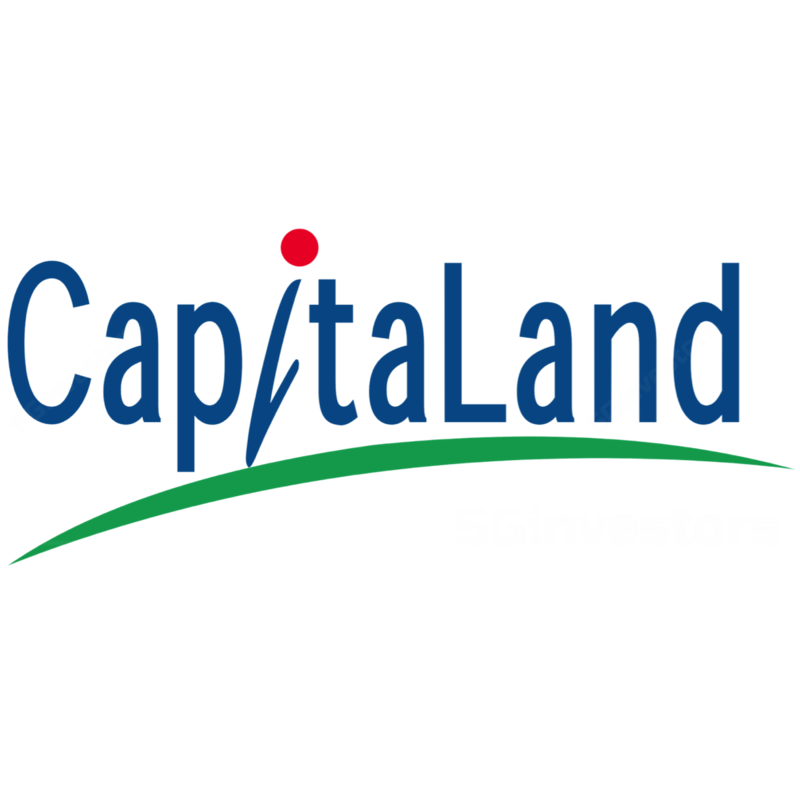 For 1H18, CapitaLand has already divested S$3.1bn of assets, realising a gain of S$140mn. Notable divestments in the quarter include the Twenty Anson sale for S$516mn, 19% above FY17 valuation. Nonetheless, we would not be surprised to see further turnover of assets especially with accommodative cap rates in the Group’s core markets. + Same-mall y-o-y tenant sales growth stable at 5.4% for China, CAPL’s biggest market. Overall tenant sales jumped 20% y-o-y, driven by the ramp up in retail operations in Raffles City Changning, Shenzhen and Hangzhou since opening in 2Q17. On a same-mall basis (excluding new mall openings in FY17), tenant sales still grew a healthy 5.4% y-o-y. Both numbers are comparable with the numbers reported for FY17. + Overall Serviced Residences RevPAU grew 4% y-o-y, driven by strong performance in China, the Group’s biggest market by portfolio valuation. Same-store RevPAU for China grew 8% y-o-y, offsetting the 6% drop for the Southeast Asia and Australia region (ex- Singapore), which is the second largest market for the Group by portfolio valuation. - Launches in China deferred due to cooling measures. While 97% of launched units in China were sold as at 30 June 2018, the Group deferred several launches due to ongoing cooling measures and restrictions in selling prices allowed for certain projects. The Group has close to 4,200 units launch ready units to be released in the next 6 months. CapitaLand has close to S$4bn worth of sold residential inventory in China and Vietnam which are yet to be handed over (S$3.2bn for China and S$800mn for Vietnam). We estimate close to half of these will recognised in 2H18 which will provide further support to earnings on top of recurring income. Underlying operating metrics for the Group’s recurring income portfolio ( > 80% of total assets) in retail, office and serviced residences are stabilising or improving. CapitaLand has iterated plans to maintain a 50:50 capital allocation balance between emerging and developed markets, while maintaining an 80% exposure to recurring income assets. This could suggest further upcoming investments in trading properties in the Group’s target emerging markets such as Vietnam. Maintain Accumulate with an unchanged Target Price of S$4.19. We maintain our ACCUMULATE rating with an unchanged target price. Our target price translates to a FY18e P/NAV ratio of 0.97.